Crohn’s disease causes inflammation of the lining of the digestive tract, which causes diarrhea, abdominal pain, malnutrition, loss of weight and tiredness. This inflammatory disease can originate in several parts of the digestive tract in humans. In Crohn’s disease, the lining of the gastrointestinal walls becomes too porous and damaged, allowing semi-digested food particles and foreign molecules, such as proteins and toxins entry into surrounding membranes, into the blood and tissues. An alarm is triggered in response to these deviant substances; there is an invasion of microbes with bad intentions. The immune system naturally responds similarly with symptoms comparable to a bout of food poisoning. Chrons`s drug – Humira – Side Effects: Warnings, stop using Humira and call your physician right away if you have any of these symptoms of lymphoma: night sweats, weight loss, fever, tiredness; pain in your upper stomach that may spread to your shoulder; feeling full after eating only a small amount; feeling light-headed, rapid heart rate, easy bruising or bleeding, pale skin; or liver problems – upper stomach pain, loss of appetite, dark urine, itching, clay-colored stools, nausea. Also call your physician right away if you have: signs of infection.. etc..
A positive clinical response was found in 9 of 10 Crohn’s patients that used Medical Marijuana on daily basis – According to the researchers. 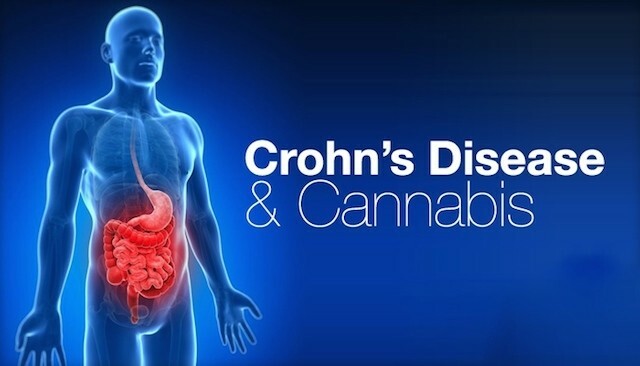 Online Mmj Doctor Notes : Medical Marijuana Doctors commonly recommend Medical Cannabis for Crohn’s disease. Click here for in-person appointment with a California Licensed 420 Doctors. To get your medical Marijuana Card Online from the comfort of your own home sign up here.